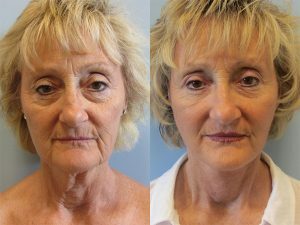 This 65-year-old woman desired rejuventation of the facial skin, including upper and lower eyelids and fat grafting. 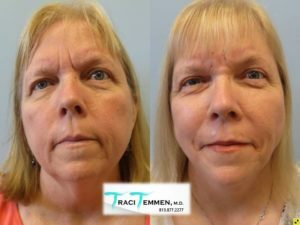 The patient came in to see Dr. Traci Temmen about a face and neck lift, lower and upper lid blepharoplasty, as well as fat grafting to the face to rejuvenate and improve the fullness of her skin. 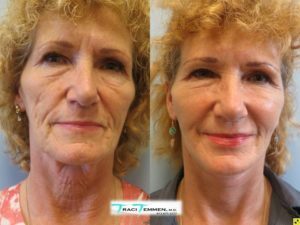 The fat grafting also helped to smooth out even more of the fine lines that were harder to get with the face lift procedure. The patient is over all very satisfied with the outcome of her surgery and her youthful new look. This is a 60-year-old woman who desired a more youthful looking appearance. The patient had tried using fillers multiple times, but wanted something that would last far longer. 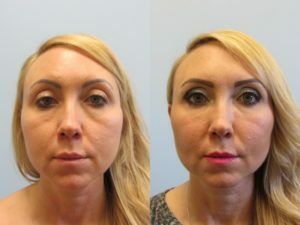 Dr. Traci Temmen performed a face and neck lift, as well as fat grafting to the cheek area to give her cheeks a fuller look. This patient easily shaved 10 years off of her age and looks better than ever! This 42-year-old woman was unhappy with the shallowness in her upper cheeks and under her eyes. After consulting with Dr. Temmen, she decided on fat grafting to the face. 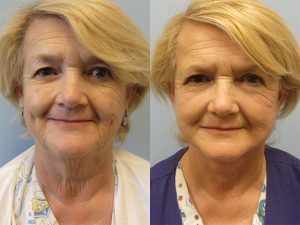 Dr. Temmen was able to precisely add fat to the shallow areas, creating a much more youthful look while still retaining a very natural appearance.